We now have a good look at the new JTBC drama The Package starring Jung Yong Hwa (Three Musketeers) and Lee Yeon Hee (Reunited Worlds) with the release of a 3 minute preview trailer. 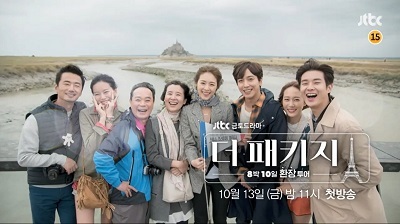 We get plenty of time with Jung Yong Hwa and Lee Yeon Hee as we learn their stories and see their romance begin to blossom in France. We also meet all of the other characters on our tour and learn about their challenges. I can’t say enough how absolutely beautiful this drama looks! The scenery is just something else. And I love seeing our beloved kdrama actors on location for the drama. It creates a very unique feel and makes me all the more excited to go on this tour of France with them.